"An unexpected garden encounter with a swaying 3-metre-high steel and rock sculpture is a delight typical of a visit to Rachel Hirabayashi’s home. Rachel, award-winning artist and founding member of Hullabaloo artist’s collective in Cromwell, has created a world where everyday materials and commonly-viewed scenes are transformed into whimsical kinetic structures and paintings which transfix the gaze. Her prolific output is the result of her energy and harmonious routines. Mornings see Rachel and her dogs walking to Cromwell Historic Precinct for coffee and a catch-up with fellow artists at Hullabaloo Art Space. The gallery was formed in 2006 by a group of 15 like-minded Otago contemporary artists and shows paintings, prints, photography, sculpture, ceramics and works of mixed media. The collective shares the curating and sales aspects of running a gallery and members exhibit their own work on a rotational basis, with new exhibitions hung every four weeks. Rachel describes the gallery and collective as the ‘glue’ that supports her practice, and greatly values her daily interactions with both. The environment, both inside the gallery and out are immensely inspiring for her. Thus nourished, Rachel returns home and begins ‘playing’ with metal. 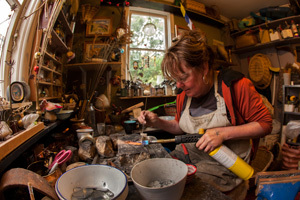 As well as large sculpture, one of which occupies a public space in Arrowtown, Rachel creates whimsical smaller works. Recycled tin (supplied by her neighbours), copper and wire are snipped, bent and welded to become finely-balanced kinetic constructions that beg to be set in motion. Double-jointed pieces featuring stones, donkeys, birds – or even bicycles – nod, turn and swing pendulously at the touch of a finger. Free-standing or wall-mounted, the meccanno-like creations juxtapose mass and fragility. Flowers and leaves are rendered from thin crimped metal and made delicate and beautiful. A friend of Rachel’s taught her the technique of brazing, and the patina achieved during this process gives the metals a weathered, rusted texture, which is also a feature of her paintings. By 4pm Rachel is ready for the ‘serious’ part of her creative day. Fortified with a glass of wine, she begins the more emotionally demanding act of painting. Often joined by others in an open-house environment, she works until mid evening. A self-taught artist, painting and drawing have been life-long activities for Rachel, her father’s painting activities ‘normalised’ the occupation for her and his work continues to inspire. After leaving school she worked as a children’s book illustrator and graphic designer in Auckland – her hometown – before heading overseas. Extensive travel included time spent living in semi-rural Japan with her then husband’s family. Here she was constantly drawing and painting in watercolours. Rachel was impressed by the high regard in which artists are held in Japan, where it is normal for full-time artists to be members of artist’s guilds. On returning to New Zealand Rachel completed a degree in Art History and Theory at the University of Otago and continued to develop her art, shifting to acrylics. Travel beckoned again, this time North and South America, particularly Mexico, where she lived for some time. Here she remembers the impact of viewing paintings and murals by Frida Kahlo and Diego Rivera, as well as the intensity of Catholic imagery with its Latin American pagan realism. Learning Spanish and return trips, most recently to Bolivia, continue to refresh her imagination. Since establishing herself in a 100-year-old cottage in Cromwell, Rachel’s travel journals, the surrounding landscape, and her interest in Central Otago’s history have been starting points for a number of series of works in acrylics, both large and small. Rachel does not work from life: her finished works are images or ideas filtered through ‘emotional memory’. She values the imagery, colour, detail, scale and light to which travel has exposed her. 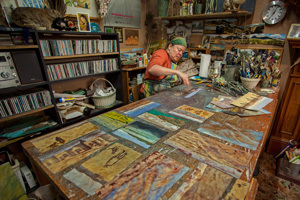 Recent series, such as Pioneers, Flood and Gold Town have shown Rachel’s strengths with colour, texture and composition. Fields of luminous colour are held in balance by skyline, horizon line, or fence line, with dark and light working in harmony. Rachel’s technique of layering pigment and washes on the surface evokes a sense of veiled stillness and of timelessness. Each series shares compositional themes and repeated motifs such as early settler’s dwellings, humble churches and stone buildings, water, and – occasionally – goats. Her recent themes include landscapes, settlement within a landscape, and landscapes lost or changed through human’s land-use. Her palette evokes arid plains, the diverse qualities of light and the forceful yet sinuous nature of water. Over recent years Rachel has formed a distinctive visual language and her work is admired and collected by locals and international visitors alike. She has won numerous awards and regularly exhibits around the region. 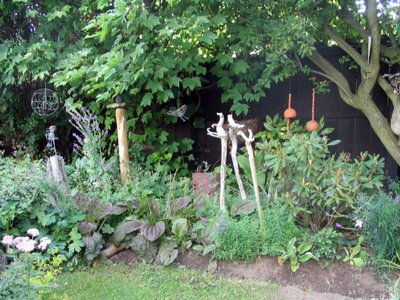 In addition, she has created a fascinating and idiosyncratic garden that she describes as ‘a work in progress’. Rachel’s routine, energy and imagination have, at the end of her day, resulted in works that can delight and enrich our own. 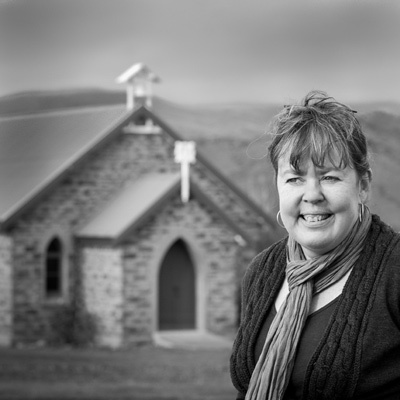 Rachel’s gallery and garden are open to the public at 16 Horace Street, Cromwell. 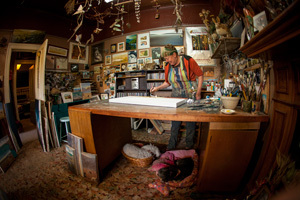 Hullabaloo Art Space is open 7 days a week at Cromwell Historic Precinct."